The Guilford County Schools First Generation College Planning Cohort Program, under the supervision of Mrs. Evelyn Hobbs, of the Office of Diversity, Equity, & Inclusion, is now in its second year. The program has assisted over 100 students, most of whom are first generation, from throughout Guilford County Schools in developing comprehensive college-bound plans to expand college access and successfully navigate college admissions, scholarships, and financial aid. Participating students have been offered admission to such top colleges as Amherst, Bates, Williams, Swarthmore, George Mason, UNC – Chapel Hill, Davidson, Wake Forest, Duke, and Johns Hopkins. Burns notes, “I never imagined that something like this would be possible. I never imagined that I could be offered admission to a school like Northeastern. Prior to joining the Cohort, I had resolved to attend school in North Carolina and to take out student loans. To become a ‘Torch Scholar’ and have a full scholarship is surreal. I am so grateful to Guilford County Schools and the College Planning Cohort Program. Without the program, support of my parents, and guidance of Mr. and Mrs. Wynn, this would not have been possible.” Burns plans to major in political science and global affairs, with aspirations of entering into public service. Nearly 200 students in grades 9 – 12 are currently participating in the foundation’s College Planning Cohort Program, operating in North Carolina, South Carolina, Georgia, and Texas. 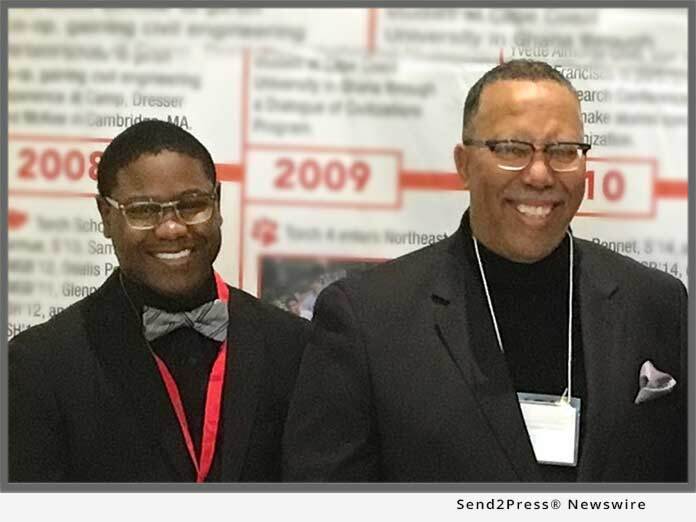 *Photo Caption: Pictured in the photo is Mr. Wynn (R), Otis’ nominator, and Otis Burns (L), a senior at Northern Guilford High School, in Greensboro, North Carolina. "I never imagined that something like this would be possible. I never imagined that I could be offered admission to a school like Northeastern," said Burns.